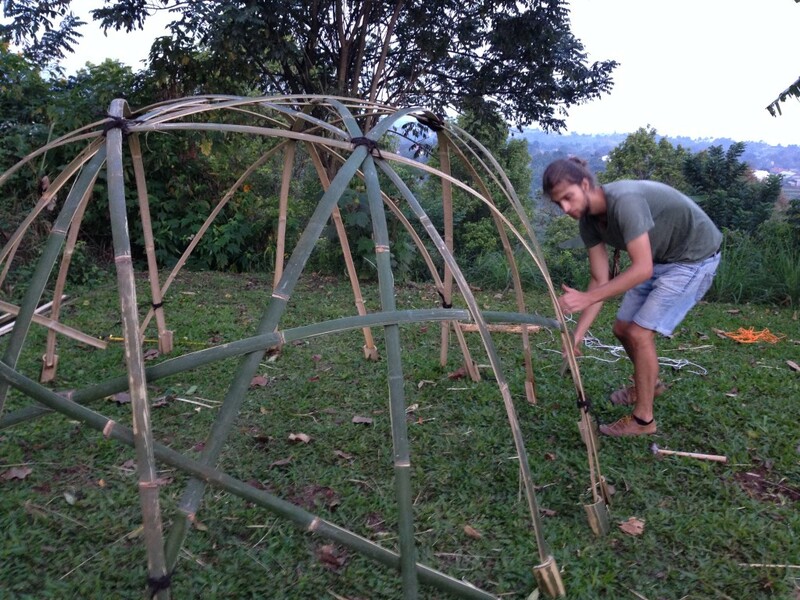 We just built two beautiful geodesic bamboo star domes for the Wangunsari Permaculture Project in Indonesia, the smaller of which has been fitted with netting and put to use as a chicken tractor while the larger one will serve as a trellis. They turned out to be beautiful but also extremely durable and relatively light structures that you can use for anything your imagination allows! As we went through quite a learning process and felt that the second one turned out a lot better (and faster) than the first, we decided to share our insights in this step-by-step guide. We used this website as a guide (although we applied some different building techniques and made some additions) and you should definitely check it out for the calculator it offers: you can either enter the preferred diameter of your dome (the d variable) or the length of your bamboo bars (the lbow variable) and it will calculate the respective variable (and some other data) for you – very useful! Length, diameter and quality matter! 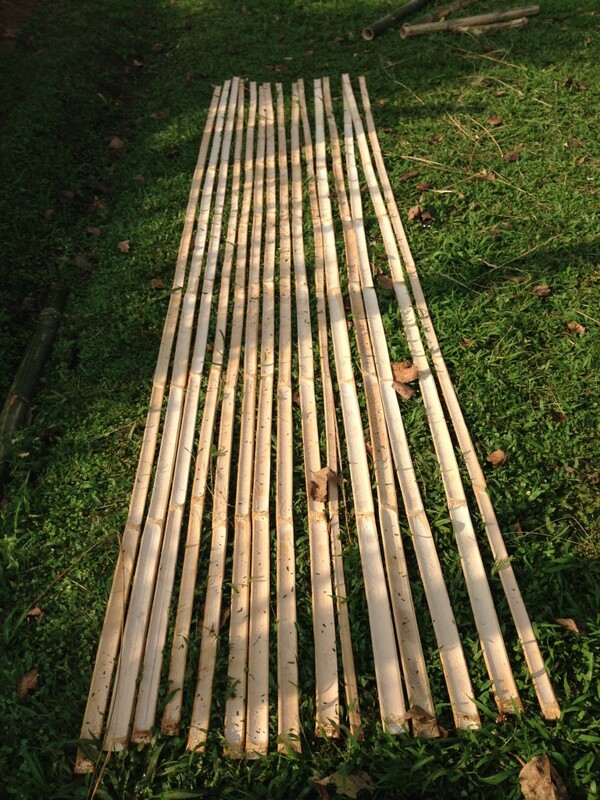 Make sure to choose bamboo bars that are neither cracked nor tilted (too much) to one side. The amount of bamboo depends on the size of your dome but if it’s your first try you might want to get some additional bamboo bars in case something goes wrong. Split the narrower end of your bamboo with a machete, then squeeze the piece of bamboo into the crack. 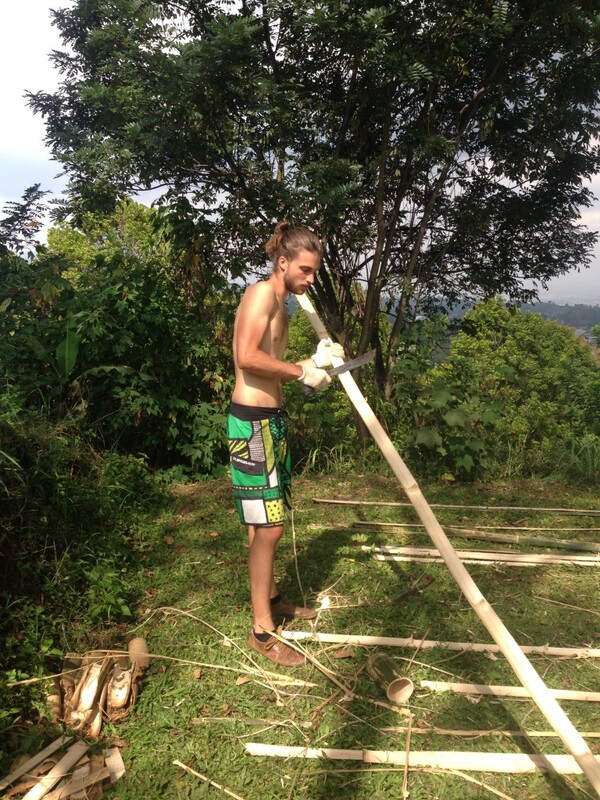 You can use several bamboo pieces at once to split your bamboo right away into more sections. 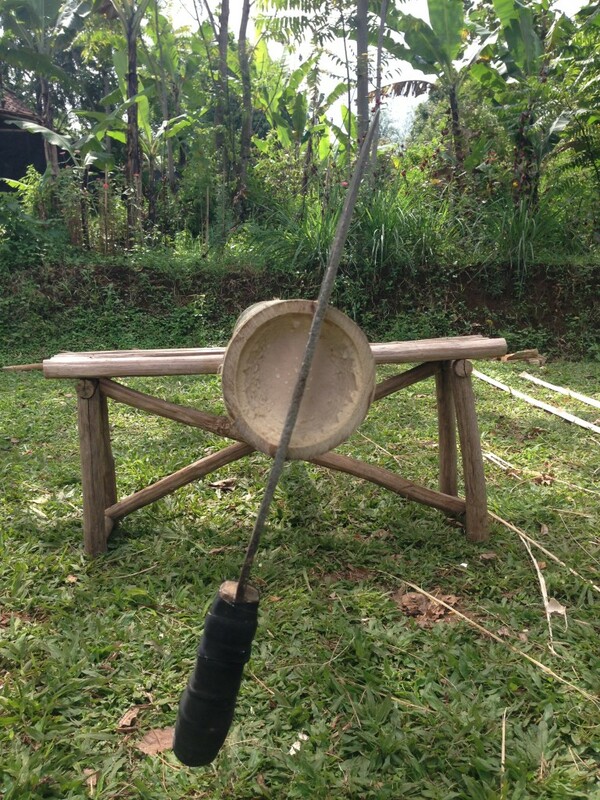 Once you have inserted one, two, or three pieces of bamboo into the narrower end of your bamboo pole, you can split the length of the bar by pulling / bashing with a hammer. If you’ve got two trees standing close to each other you can also lock the bamboo pieces you’ve inserted between the trees and push the pole through the space in between the trees. 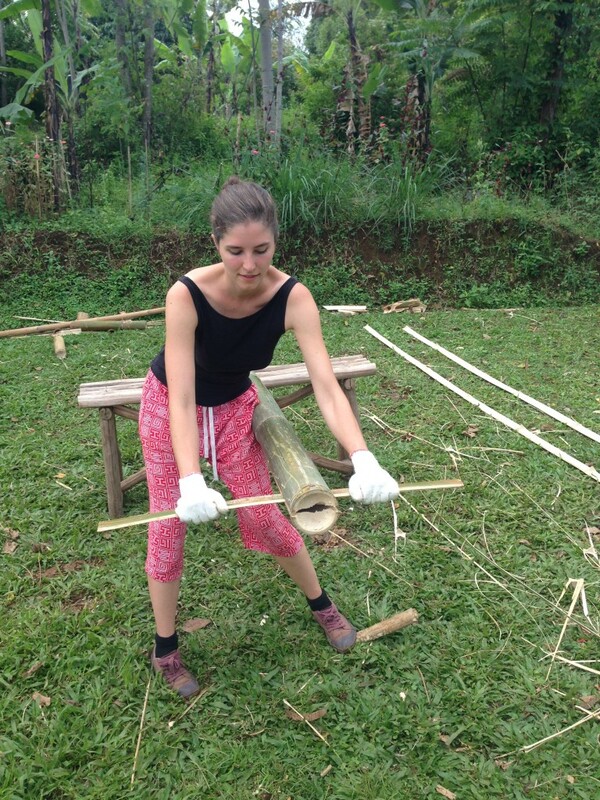 Once you’ve obtained all of your 18 long bamboo bars (use only the ones that are not cracked), cut off splinters with a machete and slice off the bits sticking out on the inner side, flattening the bamboo to make it more flexible. Make sure that the selected bamboo bars are flexible enough to bend into shape (we had to learn this the hard way when we selected bamboo pieces that were too thick – most of them cracked when we set up the dome). This is probably the most difficult part since it requires some imagination and patience. Basically it’s about laying out two star patterns (one pentagram and one pentagon) on top of each other with 5 bamboo bars each. All the bamboo bars have to be interconnected which gives the structure its stability. We have found the best description of the envisioned pattern on this website. Make sure that the length between each bamboo tip and the central point is equal. 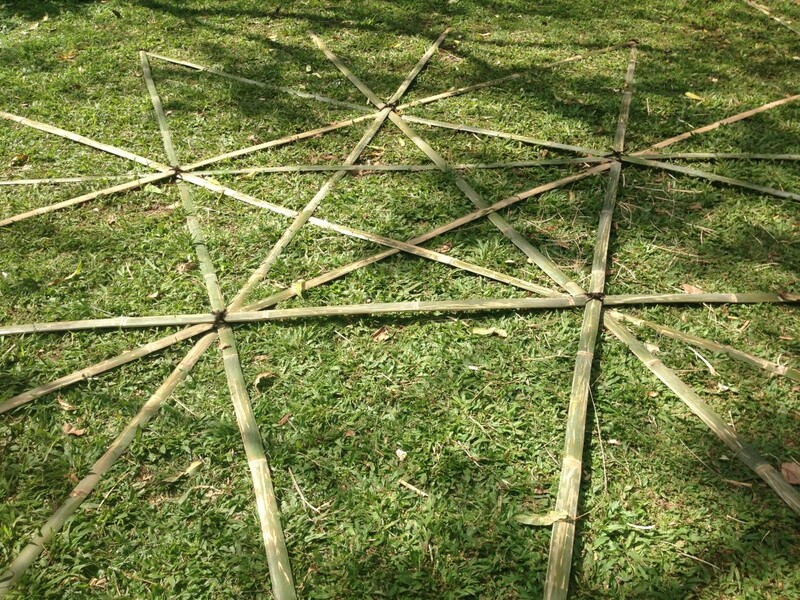 Once your star is in place, tightly bind the five edges of the pentagon with rope (you can also use nails, although you risk splitting the bamboo). 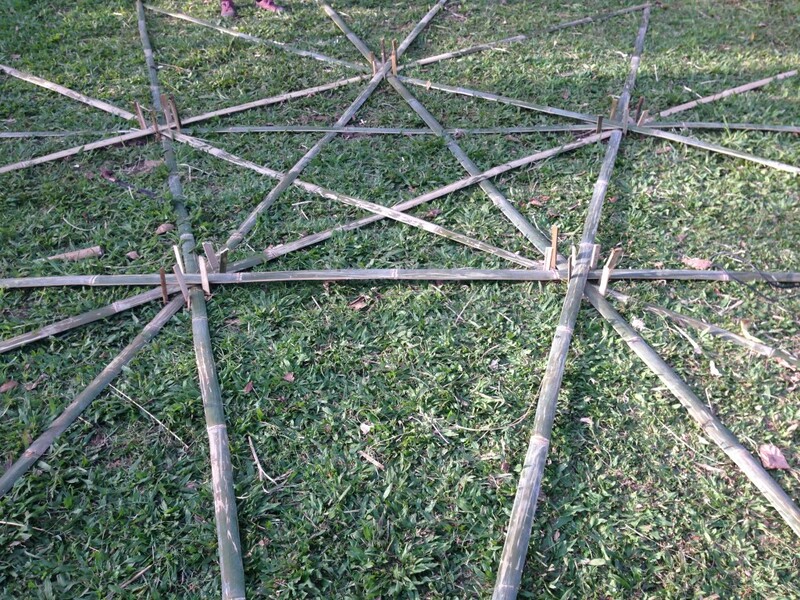 Mark a circle with the diameter of your bamboo dome on the ground. 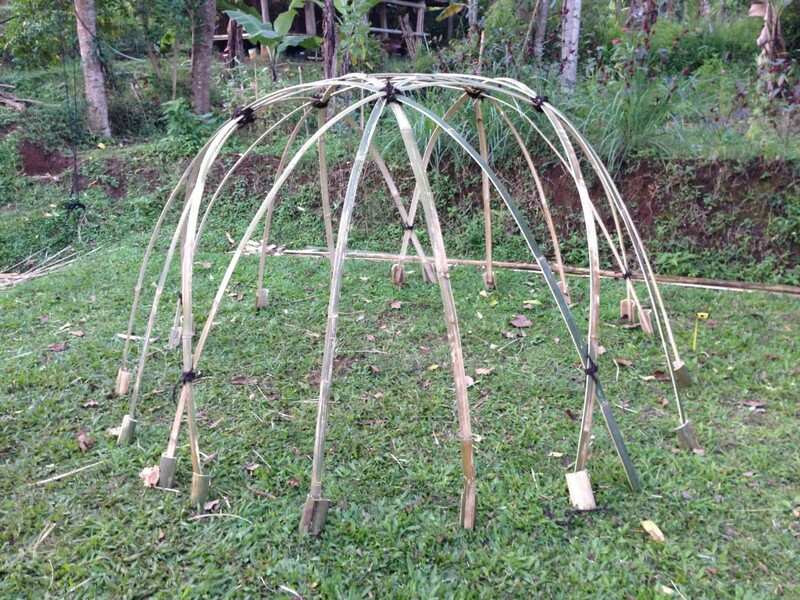 If you can gather a good amount of people (5-10) it’s easiest to put up the dome together by each holding two ends of the bamboo sticks and then walking towards the center. Hold the ends in place around the circle. We put the dome up with just two people which works fine, too. We simply used 15 around 20cm-long pieces of bamboo split into half and hammered them into the ground in equal distance to each other around the circumference of the circle. 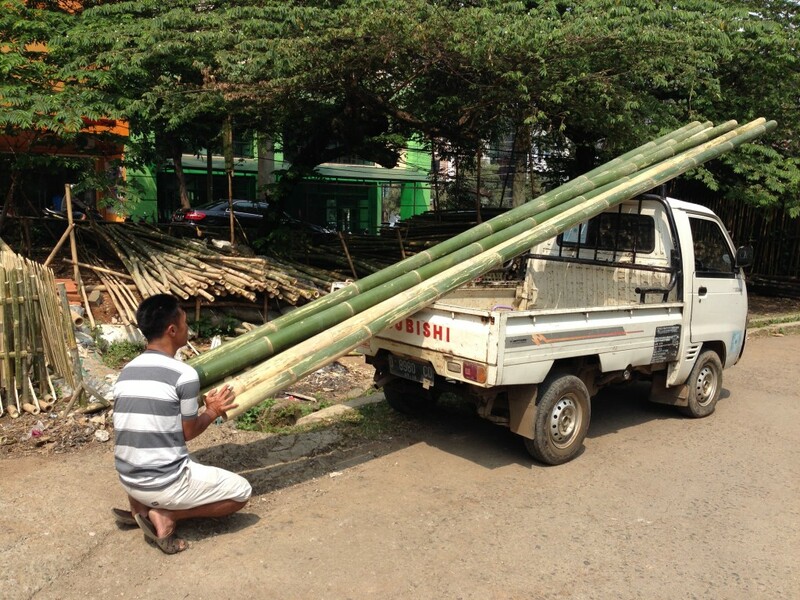 We then pushed the structure up against the bamboo poles and made sure that each end was held in place by one of the bamboo pieces. Once your dome is set-up like this, five more bars have to be added to shape the star pattern on the sides of the dome. Around the sides you should have 5 V-shapes (where two bamboo bars meet) and two loose bars in between each pair of Vs. It’s these loose ends that you now connect by weaving the remaining bamboo bars through the side of the structure always connecting two loose ends (it’s easiest to figure out which end goes with which by looking at the photos of our dome). The last three remaining bars can be used in the end for attaching the bamboo tips at the very bottom (in a circle all around the dome) which gives the dome its ultimate stability. You could use some strong rope instead, but we preferred the bars for a more long-lasting result.